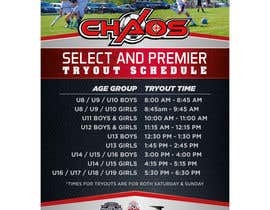 I need a graphic designed with our clubs tryouts times for the upcoming tryout. The graphic/flyer/picture needs to be 5x7 in size. Attached: "tryout [login to view URL]"
This file contains the data that I need represented on the graphic. Please view "tryout flyer 2016" to view our tryout flyer.